Music programme featuring sessions from contemporary and classic artists. Guests include Kings of Leon, Jack White, Sting, Banks, M83, Kandace Springs and Jimmy Page. Later... With Jools Holland returns for its 49th series with the sort of exclusives that makes it the key taste-making destination in music television. 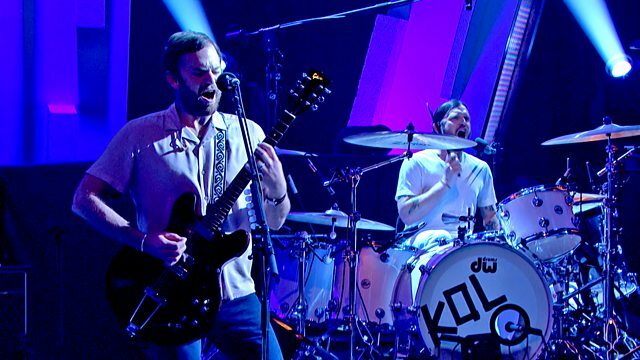 Nashville's Kings of Leon return to Jools's theatre of dreams with their first album in three years, Walls, which finds them re-energised and returning to the anthemic sound and classic songwriting of their best work, thanks in part to producer Markus Dravs. Jack White has appeared on the show with the White Stripes, The Raconteurs, Dead Weather, and recently toured and fronted not one but two bands of different genders, but now he makes his solo acoustic debut, re-interpreting songs from his back catalogue, many of which are previously unreleased, ahead of a whole album collecting acoustic work from 1988-2016. Multi-Grammy award-winning Sting has sold over 100 million albums and has been touring the past two years with both Paul Simon and Peter Gabriel, but he has also found time to make his first straight-ahead rock 'n' roll album in many a year. 57th & 9th refers to the street he crossed on his way to the New York studio where he recorded this thirteenth solo work, showcasing Sting at his canniest and most direct as displayed in new single I Can't Stop Thinking About You, which echoes his work with The Police. Stir into that the dark R&B of LA's Banks, who is about to release her second album The Altar, and Antibes-grown LA-based Frenchman Anthony Gonzalez's band M83, with the delightful 80s inflected disco dream pop of seventh studio album Junk, and you've got the kind of mix that only Jools can provide - all quality, no filler. Nashville born-and-bred singer, pianist and songwriter Kandace Springs performs a track from her sparkling full-length Blue Note Records debut, Soul Eyes, a winning fusion of jazz and soul. And legendary guitarist and founder of Led Zeppelin Jimmy Page makes a trip to chat to Jools.